I still don't have Internet at home (after the snow storm!) hence the intermittent blogging. But I have been busy in the kitchen trying out new recipes and giving a twist to the old ones. 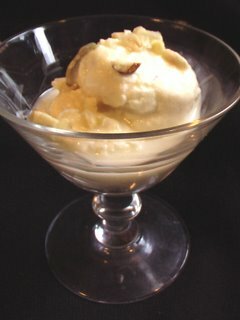 Using Bengali rasmalai as my inspiration, I made this for dinner with my friends recently. The ingredients are simple. I let the taste of milk and coconuts do all the talking. 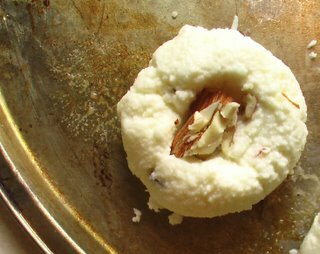 They are cheese patties look much like rasmalai but are thicker with almond filling. 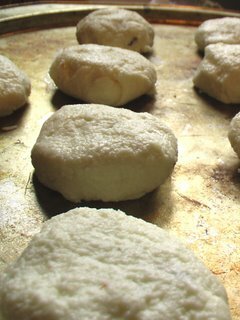 They are then covered with coconut syrup. They are not dunked, but the syrup is poured over right before serving. This is quick and simple and sure to light up your dessert conversation! Enjoy. Heat a thick-bottomed pan, and heat the ricotta cheese and sugar together till they mix well. Pour the mix in a cheese cloth and let it hang for about 30-min till the excess water drains off. Divide the dough in small balls. Make a hole in the center, and fill it with almonds. Cover it and make it into small patties. Line them on a cookie sheet and bake it at 250 for 15 min. Heat the milk and coconut milk in a thick, wide pan. 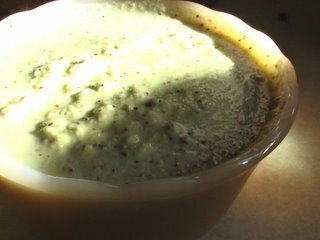 Once it starts boiling, add the sugar and cardamom and let it cook on low heat till it has thick syrup like consistency. Chill it in a fridge. Put a patty in a dessert bowl and pour the syrup over it, garnish with almonds and serve. This is also my entry for VCC at My Dhaba hosted by VKN. My calls with my parents in India always revolves around food. We ask what each of us has been cooking, what ingredients and vegetables are in season, we talk about new recipes my mom saw on television and so on. And now that they know I have a food blog, they always ask me what I have been writing about as well. Dad: Make it with coconut and steam it. Me: Hmm, interesting, what do I put? Mom (in the background): Garlic, yes but no ginger. You get the idea. I got the recipe and made it the very same evening. 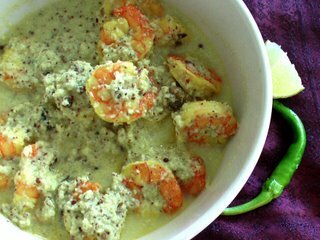 The flavors of coconut, and posto with the sharpness of green chilli and the pungent mustard and garlic worked wonders for the shrimp. It was delicious. I steamed the mix in a cooker without the weight and it worked just fine. 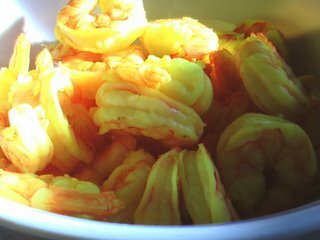 Cook the shrimp with turmeric and salt till they are turn orange and spongy, but not chewy. It can be anything from 4-10 minutes depending on the shrimp. 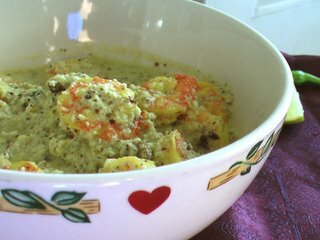 Grate the coconut, posto, mustard, garlic and green chillis to a fine paste. Heat a vessel you can also steam the shrimps in later. 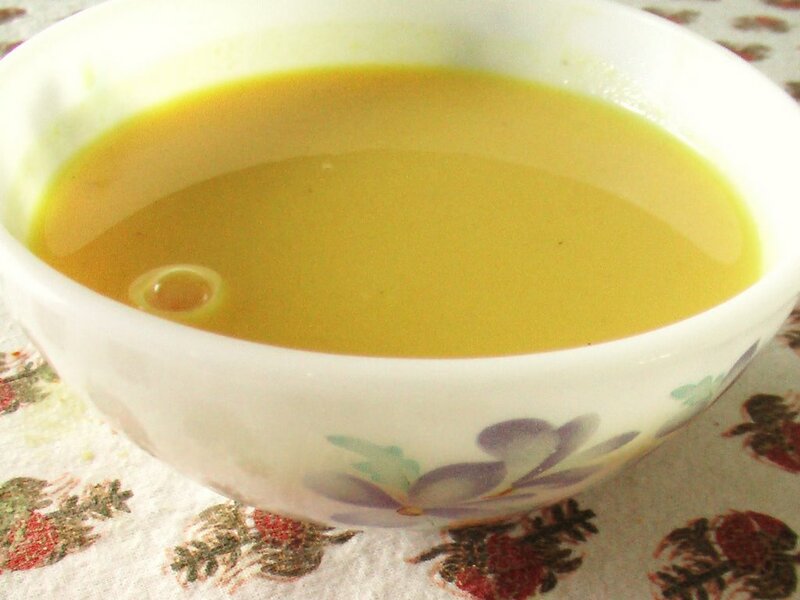 Temper the oil with panch phoron. Add the masala and sauté for a couple of minutes till the raw smell goes away. Then add the shrimp, turmeric and salt. In the meantime, boil some water in a pressure cooker. Once it starts boiling, put the pan in, close the lid and let it cook in the steam for 7-8 minutes. When Vee announced the JFI - Diwali treat, it got me thinking. 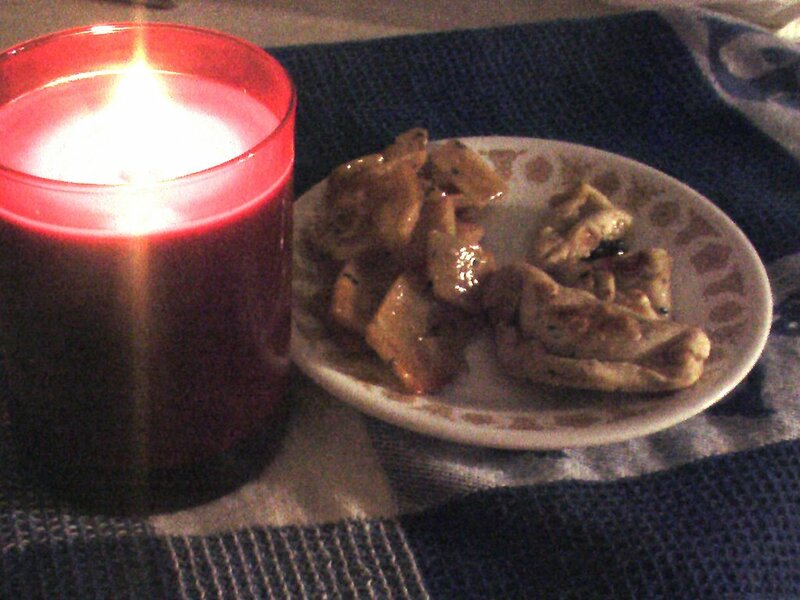 I went down my memory lane to remember what is that one thing that I always had for diwali, no matter where I was. And it turned out to be shakkarpare or gujia, sometimes both. 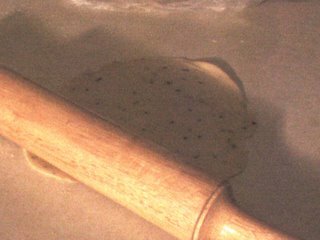 Knead the dough with ghee and nigella seeds. I used unsweetened butter. Keep it aside for a couple of hours. In the meantime, prepare your sugar syrup. Heat a wok with water and sugar on low heat. When it starts boiling add in the cardamom powder. My mom used to tell me to make the consistency - do taar (two strings). I never understood it till I made it. Once the syrup starts boiling and becomes relatively thick do this test. Take a drop of syrup and put it on your thumb. Stick your fore finger on the syrup and test the thickness. You should see the syrup make two strings. At that point, take it off the heat. Divide the dough in medium balls and roll them out like chapati without using any dry flour. Cut it into squares. First cut the chapati horizontally making medium strips and then vertically. 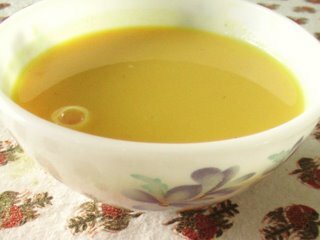 Heat the rest of the ghee and olive oil in a thick bottomed vessel. Once it is hot, put in the squares in and deep fry till they turn golden - not too brown, just golden. Take it out and dung them in the sugar syrup. Take the shakkarpare out and store in airtight container. While returning home on Thursday night, I couldn't have imagined that I was driving in the midst of a major snow storm. Thursday and Friday recorded highest snowfall (up to 30 inches in some areas) in Buffalo's 137 -year weather history. 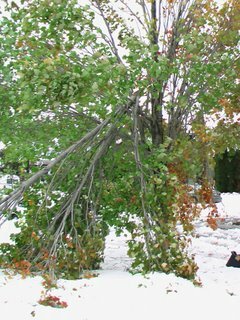 Even the trees weren't ready for winter! 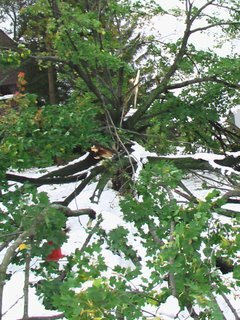 The storm affected more than 80 percent of the trees in Buffalo and surrounding areas. Even my lone warrior is down from the thick, wet snow! The snow storm also also took out electricity for 400,000 residents (including ours). We spent our weekend at coffee shops, malls, and anywhere there was heat and electricity! When I looked out of my window on Friday morning, the landscape looked like a page out of horror movie. Wires dangling, branches scattered around in the snow and the snap of trees as they cave in to the weight of the snow! Not to mention the constant lightening and the heavy snow fall. Things started to look better on Saturday once the sun was out. If you look out of my window now, you probably won't be able to say that there was a snow storm. As the city tries to come to terms with the damages and restore electricity and heat to the neighborhoods, one thing is clear. 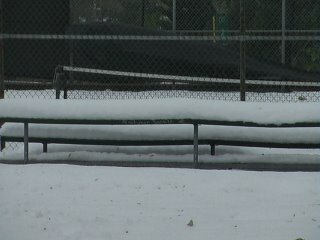 The parks and the neighborhoods will bear witness to the record snow for years to come! Fall is here and they are already talking about snow! What better way to prepare for the long winter stretch than with herbs and veggies fresh from your gardens and pots. I have received several queries about what to grow over winter. Since it is the first time for me too, I have been doing a fair amount of reading and collecting information for winter veggie gardening. 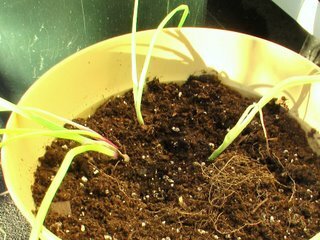 If it snows in your area, you will probably be doing container gardening, like me, indoors. 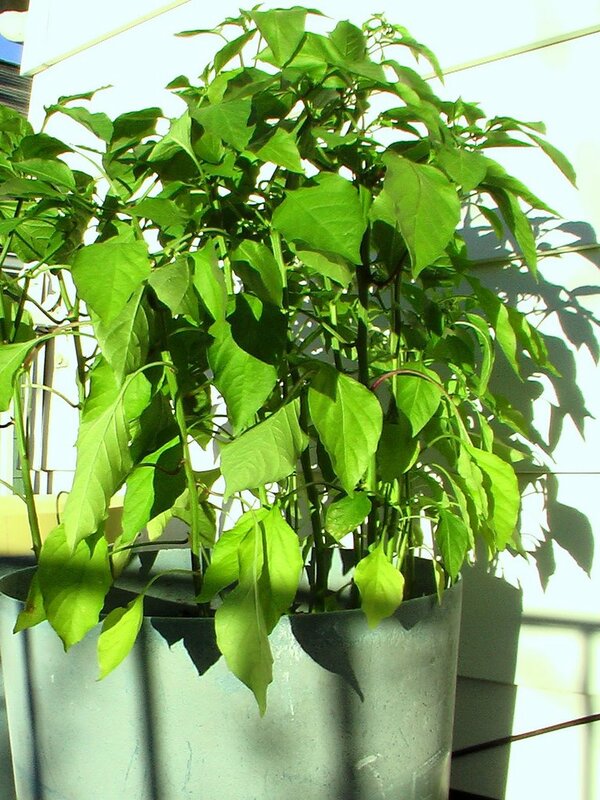 Sunlight - place your pots next to the window where you will get most sunlight. 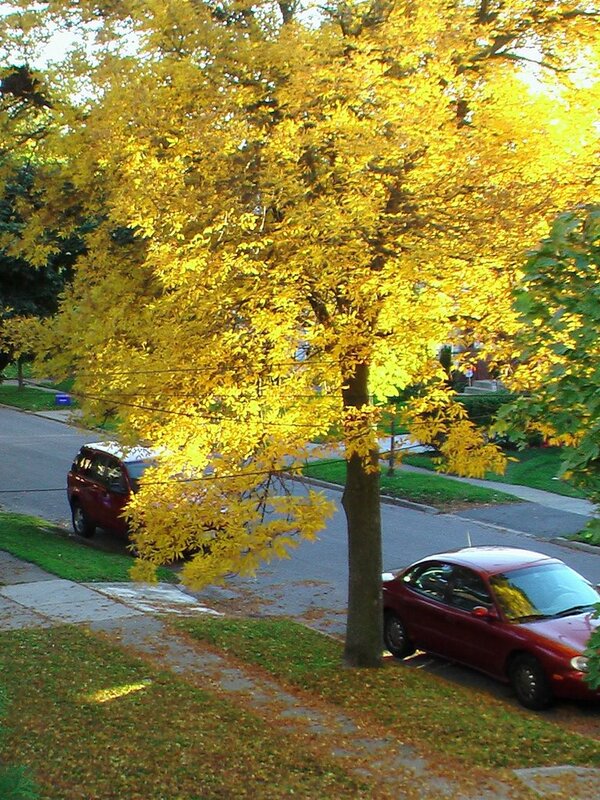 The intensity of the sunlight decreases over winter, so the maximum exposure is the best bet. Well-drained soil - Indoor plants use less water than the outdoor plants, so water them only when they need it. The above picture is of my lone warrior - my cayenne pepper plants which are still flowering and giving me long green cayenne peppers! I hope to get get a few more mirchis before snow starts. All my other pots are indoors. Winter veggies like lettuce, radish, carrots, broccoli, brussel sprouts, turnips etc - which take less space and give produce quickly are ideal choices. You can probably get one harvest in 6 weeks. These are the onion plants I'm hoping will yield onions during the winter months. Thyme, cilantro, mint, lavendar are some of the herbs which will continue to grow during the winter months. Lemon verbana, rosemary will also grow with a little more care and abundant sunlight. For additional information, you can read these articles. I found them very helpful. More here, here and here. You can find seeds in your local grocery store or in the local garening store. 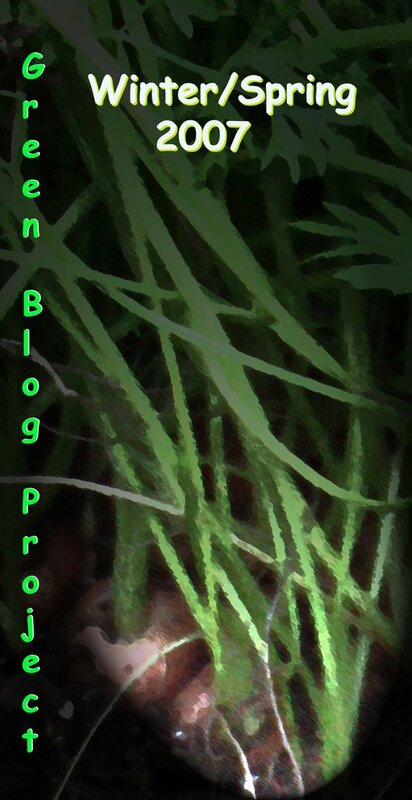 For buying seeds, herbs online here is a link. You can also buy them on Amazon.com. I saw an interesting seed kit in Amazon which controls the temperature, water and promises herbs in six weeks! I haven't used it so cannot verify the information. 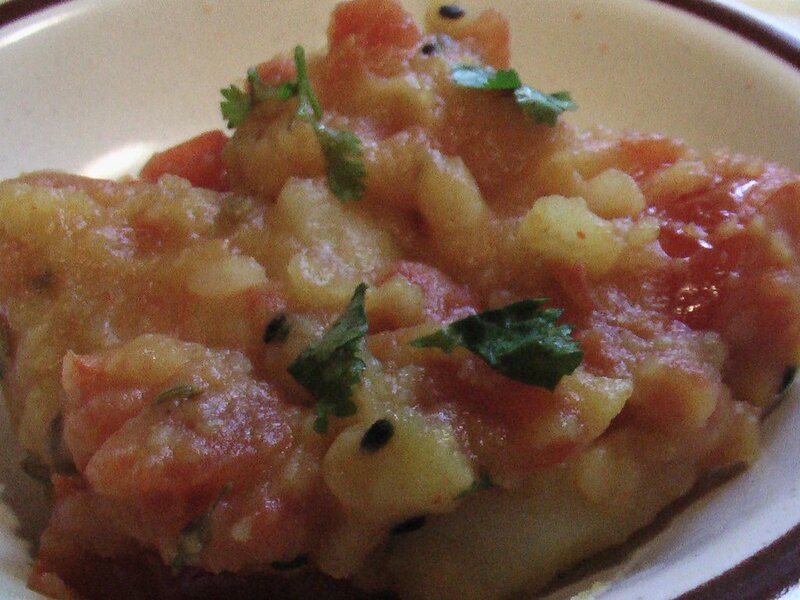 This is a simple, easy to make and absolutely delicious aloo recipe. The potatoes get their flavor from the three ingredients - tomatoes, fennel seeds and kala jeera (nigella seeds). I first had it at my sister-in-law's place in Chicago and have been making it ever since. Boil the potatoes and cut 4 in big pieces and the others in small pieces. 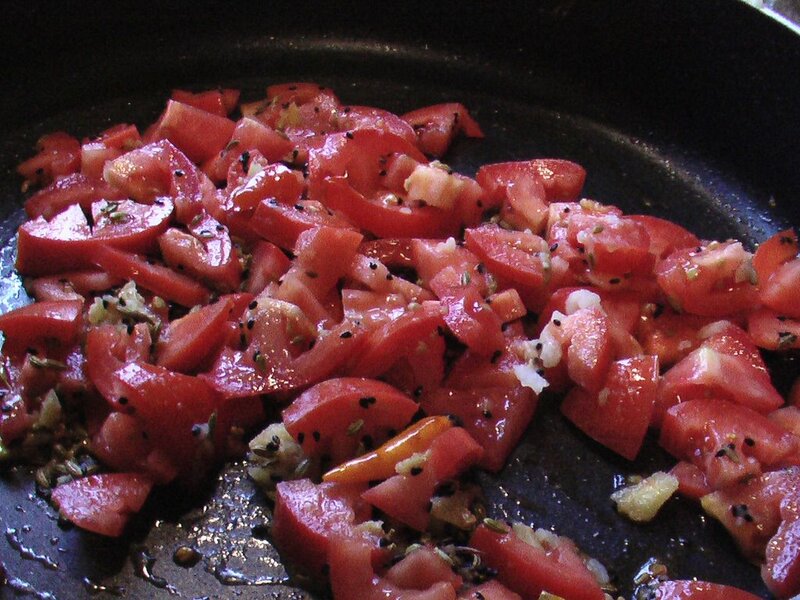 Heat oil in a pan and temper it with fennel seeds, nigella seeds, and red chillis. 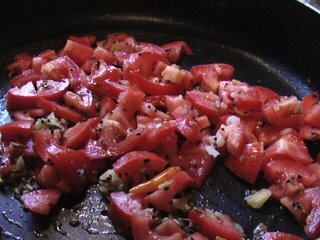 Add the tomatoes and saute it for a few minutes. 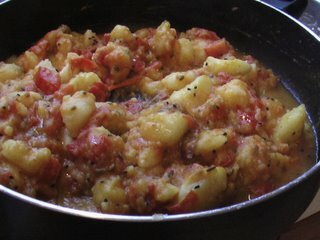 Once the tomatoes turn soft add the potatoes. Fry the potatoes well and add the turmeric, chilli powder and the coriander powder. Mix it well together and let it simmer on low heat for 6-7 minutes. Add salt and let it cook for a couple of minutes more. Take it off the heat and garnish with chopped cilantro. It goes well with paratha and simple jeera pulao. This summer, I saw a blog announcement about Green Blog Project. Hmm, interesting, I thought and wondered if I could grow something. With no backyard, I turned to pots - both big and small. With lot of enthusiasm and no experience, I hesitantly bought seeds, planted and watered them everyday. And within days, I had my own little vegetable garden. This was so new and exciting. 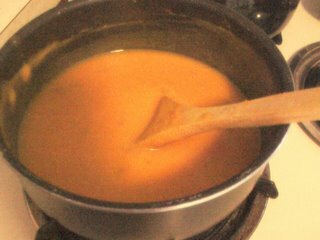 With my own home-grown vegetables, I made Tomato and Cayenne Chutney and just made Carrot Kheer. I have discovered my Green Thumb! The rules remain the same. Send me your entries with pictures of your plant and recipes by April 10, 2007. I will do the round up on April 15, 2007. Please send me your entries at ahaarmail@gmail.com. Please spread the word and I hope you will participate. Remember it will be winter here. I really could use some green! Shubho Bijoya with Carrot Kheer! Durga Pujo is the biggest festival for us - Bengalis. I know Durga Pujo is near when the days become crisp, there is a nip in the wind, and the sun shines a little brighter. Or you can take my friend's word for it who says "there is something in the air". Growing up, we got two sets of clothes for each day of Pujo. One to wear in the morning and the other for the evening. It was the time to meet the old friends, make new friends, chat, run around, participate in dances, dramas and no studies. This pujo season is coming to an end. So Shubho Bijoya everyone. May the coming year bring joy, happiness and lots of surprises. 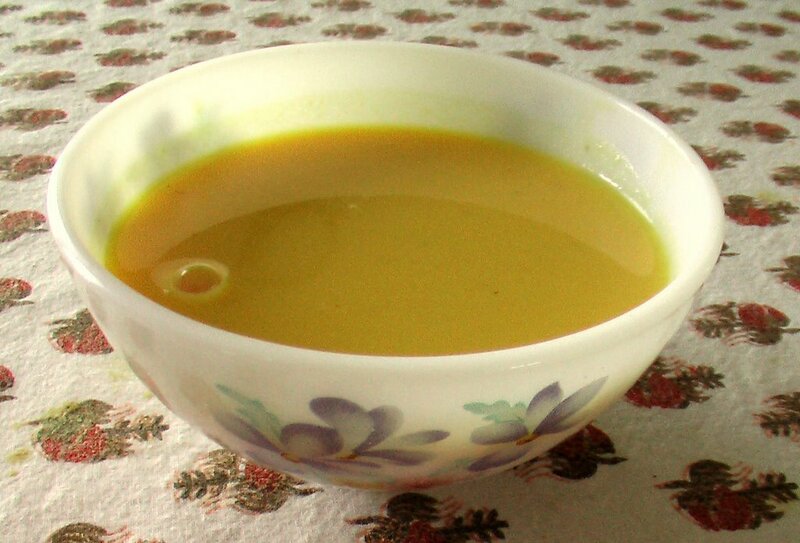 To celebrate it this year, I made something special - Carrot Kheer with carrots from my back..er potyard. Yes, carrots from my porch pots. This was also my first time trying carrot kheer and it came out great. Wash the carrots, and grate them. 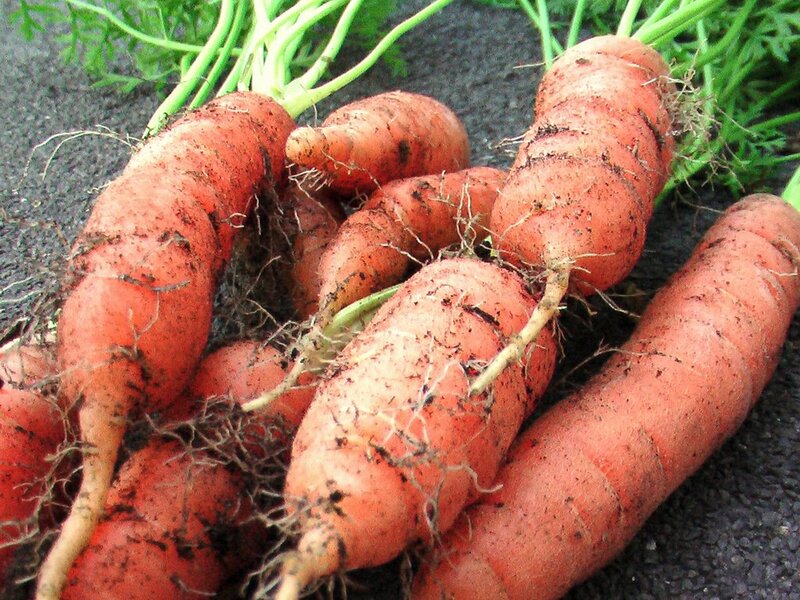 Boil the grated carrots with some water in a microwave for 7-8 minutes. Since these were tender carrots, they boiled in no time. Make it into a paste in a food processor. 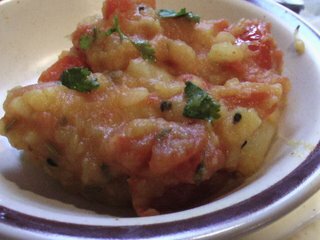 Heat ghee in a thick bottomed pan and lightly fry the carrot paste till the raw smell disappears. 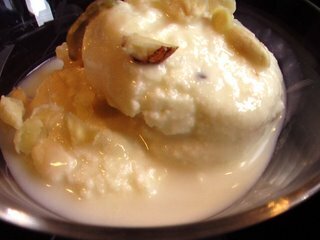 Now add the milk and cook it over low heat till it becomes thick and creamy. Add the cardamom powder, and crushed almonds and let it cook for another 4-5 min. Serve it hot or cool. This is my entry for JFI-Ghee & Butter being hosted by Cooking Medley! Update: This is also my entry for the Green Blog Project - Winter Spring 2007.